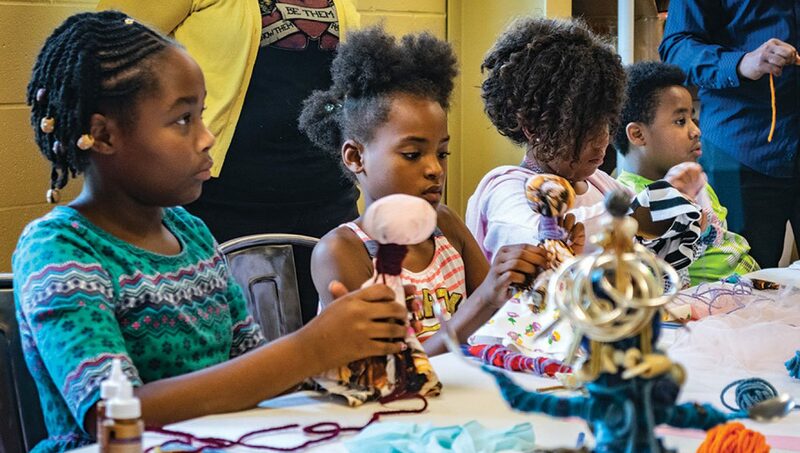 In conjunction with her FIA exhibition Vanessa German: Miracles and Glory Abound, the artist works one-on-one with visitors to help them create their own power figure to take home. All supplies provided but participants are encouraged to bring small trinkets, meaningful to them, to include in their figures. This workshop is appropriate for all ages. Based in Pittsburgh, Pennsylvania, Vanessa German is the founder of Love Front Porch and ARThouse, a community arts initiative for the children of her Homewood neighborhood. German’s work, which she terms “power figures,” is rooted in spirituality and ritual, most notably the central African tradition of nkisi nkondi or minkisi figures, characterized by protrusions of nails, signifying awakening and healing. Drawing on her experience living in Homewood, the historic African American neighborhood of Pittsburgh, German sees herself as a citizen artist and activist, who creates her work in response to the ricochet of systemic, institutionalized racism, violence, and brutality facing her community.